One of the missions Paul introduced for our new digital directorate is to encourage diversification of the housing market using digital and data technologies. As with so many other areas, we think technology will transform planning and housing, enabling new and better ways of working. There are opportunities right across the housing system, from how communities decide where houses should be built, helping people find land to build on, through to how we buy and sell property. We use the term “PropTech” – property technology – to cover this type of digital disruption in the sector. Geovation kindly gave us space in their fantastic new offices to host the event and Alex Wrottesley showed examples of projects happening in their innovation hub. Mishcon de Reya’s Susan Freeman introduced what is currently happening in the area and being talked about in PropTech. 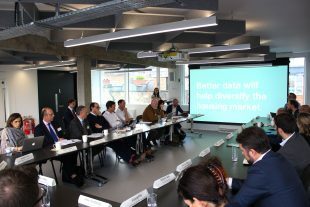 Jonny Britton from Land Insight shared his experience as a PropTech innovator and Matthew Cain from London Borough of Hackney shared a local government planning innovation perspective. Finally Paul Downey introduced our work on Digital Land Services. Many people made the point the sector needs a reliable data infrastructure upon which they can build digital products and services. The inaccessibility of the most basic data from across the public sector presents a significant barrier to innovation. We have begun working across government to improve this infrastructure including working with the Geospatial Commission to open up base level maps and common identifiers, and helping local authorities build their digital capability and make more data available. We also heard strong support for modernising the planning system. New construction methods can speed up building, but planning services remain difficult for citizens, companies and local government officers to use. One particular issue being the difficulty of finding and presenting the many different pieces of information needed to inform a planning decision. An even harder issue is how to best communicate the complex rationale behind these decisions to the local community. Digital Land presentation. Photo by @GetLandInsight. PropTech companies are already helping the housing market work better and more are emerging. There is a need to build momentum across the public and private sectors for the transformation of planning and housing systems. We are here to provide leadership, digital services and make better data available to accelerate this change. We would like to hear from you about digital and data projects or ideas you think could help improve the planning system or housing market and we will continue to blog about progress. Subscribe for regular updates and follow @becpye on Twitter. The Ministry for Housing Communities and Local Government (MHCLG) digital blog is the place to find out about what’s happening at MHCLG Digital.